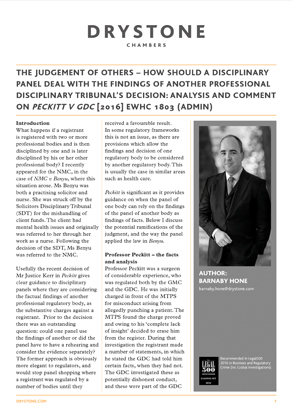 In this short analysis first published in the winter edition of the ARDL bulletin, Barnaby Hone examines the ramifications of Peckitt v GDC. In particular, how should a disciplinary panel deal with the findings of another professional disciplinary tribunal's decision? Barnaby Hone specialises in professional discipline work. His experience includes prosecuting for the GDC, BSB and NMC; appearing before the UKAD panel, at both first tier and appeal level; and he has sat as a panel member on RFU tribunals. He regularly advises regulatory bodies and individuals on professional discipline matters. This includes advising doctors on appeals, as well as disciplinary bodies on the correct interpretation of their regulations.